Kevin Braney had pleaded not guilty to the murder of Peter Butterly in 2013. A DUBLIN MAN has been found guilty at the Special Criminal Court of the “premeditated” murder of dissident republican Peter Butterly nearly six years ago. Mr Butterly (35), was chased and shot dead outside The Huntsman Inn, Gormanston, Co Meath in view of students waiting for their school bus on the afternoon of 6 March 2013 in what the three-judge court said today was not “a spontaneous act”. He died from gunshot wounds to his neck and upper back. Kevin Braney (44), of Glenshane Crescent, Tallaght, Dublin 24 had pleaded not guilty to murdering Butterly. Delivering judgment today at the non-jury court, Justice Paul Coffey, presiding, sitting with Judge Martin Nolan and Judge James Faughnan, said the court was driven “irresistibly” to the conclusion that Braney was involved in the organisation and planning of Butterly’s murder beyond a reasonable doubt. Justice Coffey said the prosecution’s case was that Braney was part of a common design to procure the murder of Butterly. Giving the court’s verdict today, the judge said the circumstantial evidence connected Braney with Butterly’s killers Dean Evans and Edward McGrath as well as with The Huntsman Inn. The court considered it “highly significant” that Braney drove to The Huntsman Inn following a meeting at David Cullen’s flat in Balbriggan on the night prior to the shooting. The judge added that the circumstantial evidence also connected the defendant with a meeting that took place the day after the murder. There was also evidence that Braney met Butterly’s murderers two days before the killing. The court was also satisfied, Justice Coffey said, that Braney was at a meeting at KFC on 7 March where “audible utterances” suggested that the men present were concerned as to why the Huntsman Inn had been saturated with gardaí the previous day and why every move they made was followed. This meeting was “so proximate” in time that the court could not dismiss it as unconnected, he said. In its judgement, the court found that former murder accused-turned State’s witness David Cullen underwent a “withering” cross-examination by the defence and Cullen accepted that dishonesty did not bother him. “He agreed he would perjure himself to avoid being convicted of murder,” said the judge. The trial heard evidence from Cullen, who described his role in the shooting of Butterly. He was originally charged with Butterly’s murder but he subsequently pleaded guilty to the unlawful possession of a semi-automatic pistol at the Huntsman Inn on the day of the shooting. His plea was accepted by the DPP, he turned State’s witness over a year after the shooting and this murder charge was dropped. 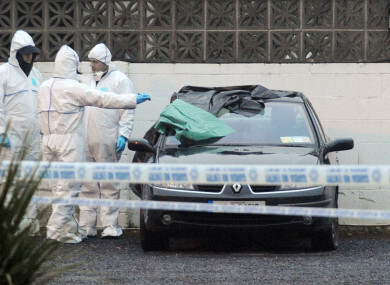 During the trial, the protected witness testified that Braney came to his Balbriggan apartment with other men on 5 March, the evening before the shooting. Cullen gave evidence that men arrived at his flat on the evening with a black sports bag but he did not remember who carried it into his apartment. Make sure this is done right and he [Butterly] doesn’t get away. Justice Coffey said the court accepted Cullen’s evidence that his role in the shooting had been to dispose of a gun in the grounds of Gormanston College and that there was a meeting of conspirators in his flat on the night before the murder. The judge said Braney was at this meeting and whilst there he discussed how the shooting was to be carried out the following day. Cullen’s evidence that Braney was at his flat is corroborated by the considerable body of circumstantial evidence in the case, he added. The judge said that the court had given careful consideration to an argument put forward by the defence that Braney was not in Cullen’s flat that night. “Such is the force of the circumstantial evidence against the accused that we cannot accept this is reasonably possible,” outlined the judge. In conclusion, Justice Coffey said Braney had been involved and participated in Butterly’s murder. Following this, prosecution counsel Paul O’Higgins SC told the court that Mrs Butterly felt she had to consider the matter briefly and talk to members of her family before she finalised her victim impact statement. The convicted man was remanded in custody until Friday, when he will be sentenced. Edward McGrath (37), of Land Dale Lawns, Springfield, Tallaght, Sharif Kelly (49), of Pinewood Green Road, Balbriggan and Dean Evans (27), of Grange Park Rise, Raheny, Dublin have all received life sentences at the Special Criminal Court after they were convicted of Mr Butterly’s murder. In 2018, Braney was sentenced to four years after he was found guilty of IRA membership by the Special Criminal Court. He had threatened an accident victim that he was in the IRA and would shoot him if he did not withdraw a claim against a former employer. Braney had denied membership of an unlawful organisation, styling itself the Irish Republican Army, otherwise Oglaigh na hEireann, otherwise the IRA on 2 August 2017. Email “Dublin man found guilty of murdering dissident republican”. Feedback on “Dublin man found guilty of murdering dissident republican”.